"Musical Express has worked with a lot of brands and products over the years. Being a distributor of the best brands, it can be a challenge to keep up the pace of our growth. In this aspect, On-Stage has played a significant part in our growth this year. Every day we get new customers pleased with the On-Stage brand and line of products. Their products are the best choice for music stores who aim to offer their customers a wide variety of options at very competitive prices. We are happy to provide our market with durable and quality On-Stage products." On-Stage Stands has opened its doors to International Import Distributors! 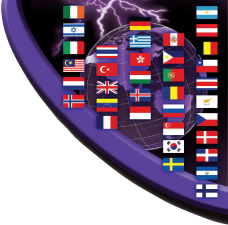 We currently have 42 international distributors, representing 69 countries that distribute On-Stage Stands. Some of the distributors include Japan, Australia, South Africa, Brazil, Canada, Mexico, Russia, United Kingdom, France, Germany, and Poland; all of which have done very well with our concepts and product line. Our staff currently works closely with over 31 factories that ship out of 3 major shipping centers in China. Over the years we have built strong relationships with our factories, which give us the ability to offer you a complete product assortment without the cost and hassle of working directly with multiple factories. Currently, our product line includes over 400 items which are available to your company in our On-Stage Stands Worldwide Distributor program. The products available in the distribution program are all US brands that are in demand by musicians worldwide. Openings for International Import Distributors! Join our growing International Distribution Division - Contact us Today!